Becoming a chef is a lengthy but rewarding process. If you love food and love coming up with inventive new ways to serve it, a career as a chef might be the perfect path for you. Chefs require dedication, intuition, skill and talent to be successful at their career. A chef is a culinary professional that works in a restaurant and prepares food as it is ordered. In a smaller restaurant, a chef may be in charge of the kitchen and may answer directly to the restaurant manager. In a larger restaurant or a more exclusive establishment, it’s more likely that the chef will answer to a head chef or executive chef. Chefs need to be skilled in a wide variety of cooking techniques and need to understand how to make many basic dishes, sauces and seasonings. Chefs in fine dining establishments will usually need to replicate dishes created by the head chef, and may need to learn these dishes on a regular basis as the menu changes often. Chefs need to be skilled in a wide variety of cooking techniques and need to understand how to make many basic dishes, sauces and seasonings. A chef will usually have years of training within the industry and usually has additional training through a culinary arts program. 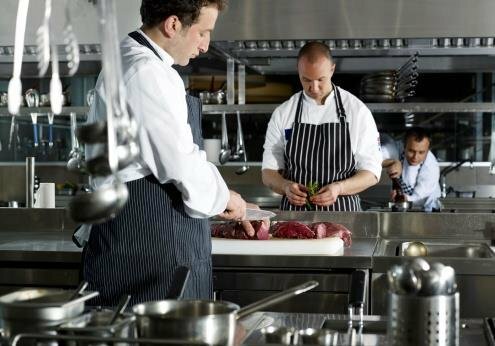 Chefs may work with assistant chefs and preparation chefs to ensure that the meals go out on time and that the food is of a consistently high quality. Chefs will often need to check the inventory of the restaurant to ensure that the food that is to be served is still fresh. A chef that has other chefs under them may need to manage personnel and find replacements if short on staff. Many chefs will need to manage the sanitation and safety practices within the kitchen, and chefs will also sometimes need to ensure that all of the equipment is in the proper and working order. If working under a head chef, the chef will also take any delegated duties as is necessary. A chef will cook throughout food service. Sometimes a chef will be assigned a specific station at which to cook, but smaller restaurants will usually have a chef wear many hats throughout the night. It will often be a chef’s responsibility to identify any slow areas within the kitchen, such as in food preparation, and to take immediate action to resolve these issues before they affect the diners. The Bureau of Labor Statistics notes that some chefs may also have to look into the accounting and inventory of the kitchen. Chefs usually need to have many years of experience in the industry, often as an assistant chef. A chef usually has some form of culinary degree, though it is not strictly necessary. The term chef is sometimes used to describe a sous chef, which is the chef directly under the head chef or executive chef. This position is highly sought after and can take many years to obtain. How Do You Advance as a Chef? Advancement as a chef is usually determined by the amount of years within the position. Chefs with more experience, skill, knowledge and talent will be able to eventually become a head chef or executive chef. However, this is a very difficult path as it does require the chef to perform extraordinarily well at many types of cooking. To become a head chef, a chef needs to be able to create their own menus and unique dishes, and needs to be proficient in managing their kitchen and their staff. Chefs can also move into owning their own companies, or can even consider becoming personal chefs. Chefs could also become bakers, which is a related field that O*Net Online notes is extremely similar.